Once a month, I'll feature my writings on some of my favorite pieces and artists. From 2012 - 2014, I was the program annotator for Bowdoin International Music Festival, and in my first year, I got to write about Debussy's String Quartet. The piece was on one of my first classical music CDs, and I remember listening to it vividly each night (probably falling asleep somewhere during the third movement). Here's a fabulous recording by the Budapest String Quartet, so have a listen, and enjoy! I should also say that I was really upset for several days by what you said about my quartet, as I felt that after all it only increased your partiality for certain things which I would rather it had encouraged you to forget. Anyway I’ll write another one which will be for you, in all seriousness for you, and I’ll try and bring some nobility to my forms. I’d like to have enough influence with you to be able to grumble at you and tell you you’re heading in the wrong direction!...You don’t let yourself go enough and in particular you don’t seem to allow enough play to that mysterious force which guides us towards the true expression of a feeling, whereas dedicated, single-minded searching only weakens it…One has to tell oneself that when it comes to art we are nothing, merely the instrument of some destiny, and we have to allow it to fulfill itself! 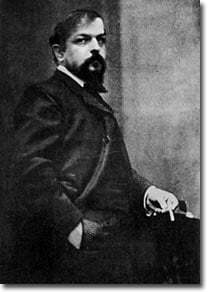 The years 1893-1912 are often designated as Debussy’s ‘middle period,’ during which he was also working on the preliminary sketches for his opera Pelléas et Mélisande and the final drafts of Prélude à l’après-midi d’un faune. Beginning with Debussy’s period of compositional maturity, we begin to see a systematic challenge of the traditional major and minor tonal systems by the use of other modal scales. In his famous remark to teacher Ernest Guiraud, he declared: “The tonal scale must be enriched by other scales…There is no theory. You have merely to listen. Pleasure is the law!” While the string quartet remains dominated by diatonic approaches to harmony, Debussy frequently draws from octatonic and whole-tone scale systems. Throughout the quartet, such non-diatonic scale systems mark important junctures in the unfolding of Classical formal processes. The opening movement follows the shape of sonata form, and Debussy organizes thematic groups in symmetrical four-bar phrases. The movement opens with a motive in the Phrygian mode. While this idea appears later in the exposition with the original melody almost fully intact, it is placed in a new harmonic context. Debussy introduces the secondary theme towards the end of the exposition, an idea that serves as the basis for the improvisatorial development. Debussy continues to employ the technique of developing variation through to the end of the movement which concludes with a brief codetta based on the first part of the primary motif. The second movement is a Scherzo in ternary form. Though cloaked in new rhythmic and timbral guises, the movement’s opening theme, played by the viola, is based on the primary theme of the first movement. What can now be identified as the quartet’s motto theme, returns, in an augmented version, in a transitional passage in the first violin. For the remainder of the movement, Debussy continues to transform this motif over a rhythmically intensifying undercurrent of varying string textures. A cello trill quietly initiates murmurs that ripple through the rest of the quartet, and with two final tutti pizzicati, this brief movement bids adieu. The third movement opens in a solitary place of contemplative quietude, as the viola intones the movement’s primary theme that remains humbly in the middle registers until its very final statement. Increasingly colored by whole-tone inflections, the music accelerates along its rapid ascent to higher registers, reaching the climax of the movement. Having reached soaring heights, the music descends and returns to its original state of serene stillness where it remains until the end of the movement. The finale presents a summation of material heard in the preceding movements, with the motto theme appearing in all of its transformative versions. A Scherzo in form and character, this movement highlights Debussy’s playful inventiveness, as some of the more memorable passages feature yet even more transformations of the quartet’s principle motif.